I’ve been off-line for the past two weeks, so my LJ activity went completely dark. But I’ve now returned from two delightful weeks at the American School of French Marquetry. I wanted to up my box game a bit, and thought some study with two extremely talented and accomplished craftsmen would be one way to do it. I also owe Paul Miller (shipwright) for his encouragement to attend. There have been a number of blogs and posts about the ASFM school, so I won’t attempt to repeat what’s been said before. Rather, I’ll focus a bit on my experience at ASFM. First of all, it’s fun. There’s a lot of continual joking and laughter mixed in with the rather demanding activities of of being introduced to a very precise art/craft. Patrick and Patrice, are both products of the Ecole Boulle in Paris. And, the French method is different from others. The process is both very structured, and extremely effective. Everyone likes to focus on the perfect cutting of tiny pieces that will comprise the picture or project, but I found the other parts of the project to be actually more interesting, and at least as important to a successful result. I’ll try to touch on these below. 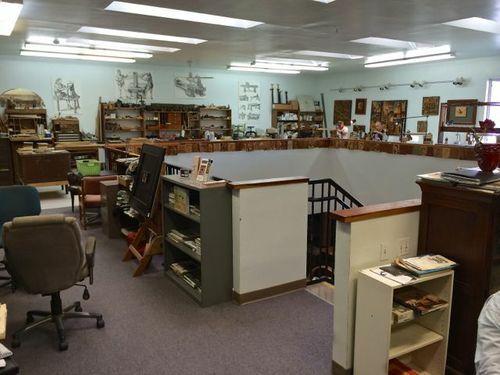 Below: To get started, here is a shot of the marquetry area of the shop. The area to the right, off camera, holds their extensive library. Both Patrick and Patrice are serious students of marquetry and period furniture. The floor below holds their individual workshops devoted to repair and construction of furniture. Patrick gets you right into the hands-on stuff in day 1, but also spends time on design, layout, and assembling the cutting packets which permit accurate cutting in the chevalet. Organizing and keeping track of all the small pieces is also critical, and they explain how this is done. ...for small projects and large. Yes, we also spent many hours at the chevalet, cutting pieces. Below: Here I am hacking away. At first, the goal is to become somewhat comfortable with using the chevalet. It gets easier. Sand shading is covered in week 2, and all the students get to shade a project with close instructional guidance. Skillful shading is a skill central to high end marquetry. Just look at some of the original French furniture for inspiration. The method of assembling the cut pieces into a complete picture is done on an assembly board, in the French manner. Each student gets a lot of experience with hot hide glue as well. I previously avoided it, but have now become an advocate, very comfortable with its use. Week 1 is devoted to the Boulle technique, or style, and everyone completes three projects. There is plenty of time, and while some students were slower than others, everyone completed the projects. Each project is carefully designed to teach the various aspects of layout, packet building, cutting, assembly and clean-up. Each project has a definite and proven purpose. Below: Week 2, Steve assembling the rose project, Barry making up his assembly board. Patrick and Patrice center. In addition to Patrick and Patrice, Kristin Arivee offers several enlightening sessions on drawing, perspective, shading and composition. All central to high level marquetry. It’s not all about cutting. I found value in all the sessions. And, at the end of week 1, each student, if he or she was paying any attention at all has all the basics of creating a rather good Boulle project. Week 2 involves a project completed in the Piece by Piece method, in which identical, multiple copies can be made. A bit more challenging than Boulle, which is why Week 1 is a prerequisite. Again, everyone successfully completed Week 2. I arrived a complete marquetry novice, and after the two sessions I feel very good about understanding how both Boulle and Piece by Piece marquetry is done. Patrick also explained elements of the Painting in Wood approach as well, though we did not practice it (it’s offered as another week course). If the student is serious, it’s hard to overstate the value of working and learning with true masters of the art. As the classes are small, typically 5 or 6, there’s always direct personal attention available. Gigi, the shop cat provided personal attention to all the students. And the food table was pretty delectable as well. I found the other students to be serious about learning, and amicable companions. All good company, four of whom stayed for the second as well. Lots of friendly banter. Some of the preferred materials for French Marquetry are difficult to obtain in the U.S., so Patrick offers these items for sale at reasonable prices. It is more a service to marqueteurs than it is a profit center, and I for one am delighted to have a reliable source. And, for those who don’t care to do all the scrounging necessary, Patrick offers a complete hardware kit for building a chevalet de marquetrie. I ordered one, as it includes everything but the wood, and makes the building process faster and less frustrating. But the kit is certainly not necessary, and will save a few dollars, as evidenced by the blogs of Paul Miller (shipwright) here on LJ. Finally, I certainly did not come away a master marqueteur in two weeks. But I did leave with a solid understanding of both the Boulle and Piece by Piece methods and enough hands on time to feel comfortable that it will be up to me how far I go toward improvement. At this time, June 2014, tuition is only $750 for each week, materials included, which for what I came away with, I consider a genuine bargain. Like all the others before me who have reviewed the courses, I highly recommend ASFM for anyone interested in learning French marquetry from two of the best. OK, I give in. This is my week 2 project. Not setting any records for precision, to be sure, but gives one an idea of just how far a complete novice can come in only two weeks. I can easily give the school my highest recommendation. Thanks for looking in. Very cool stuff Roger. Thanks for sharing. 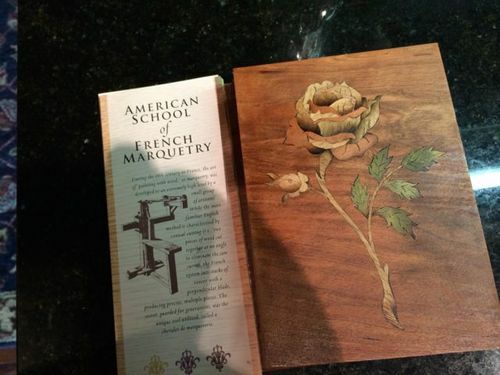 I’ve done the Marc Adams school and took Marc’s marquetry class. I loved doing it and learning the techniques, but honestly have done very few projects since then to take advantage of it. It’s not the general style of things I build. Feeling a little rusty about it all now. Keep us posted with new projects! Roger, thanks for the great description. I can see some new marquetry designs appearing in those beautiful 18th & 19th century boxes you make! I took a marquetry class with David Marks on the West coast a few years ago, but this sounds like one I need to invest in. BTW, that week 2 project is quite a pretty piece! Roger, Looks like you came away with new skills, and as Mauibob said, I see marquetry showing up on those beautiful boxes you make : ) Thank you for sharing. What a great experience to learn from such talent. Very nice project piece maybe it will end up on a box. Good luck with you marquetry endeavor. I have a million questions awaiting your next marquetry post. Man that looks like fun! Congrat’s Roger for always wanting to improve your skills. Very interesting Roger and very nice work on that piece you made. I wouldn’t mind taking the courses myself, but it’s just to long a trip for me. Good luck with your Chevalet build and your newfound marquetry skills. Plus one on what Roger states about the class. 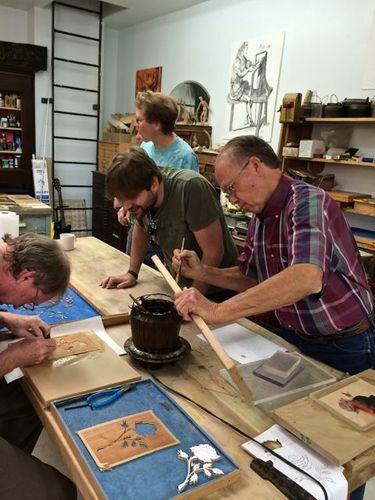 Patrick’s class is very educational (and fun) and it really helps in understand how the Chevalet works and the advantages it has over some of the other methods of doing marquetry. If anyone is thinking of doing one of Patrick’s classes I for one would recommend it from my experience as well, but beware if you do one of his classes you will want to build a Chevalet :). Roger the rose looks great by the way. Also Patrick’s plans are very good and they make making a Chevalet fairly easy to build. I used Ash for mine. Good luck on the build. WOW, another skill to make your impressive boxes even more impressive. bravo roger, i cant wait to see what you do with all of this new found knowledge and skill, i bet that was a wonderful 2 weeks, thanks for the great write up and a wonderful recommendation..
I’m a marquetry neophyte, but looking forward to producing something worthwhile. It will take a bit of practice and study, but worth it, I’m sure. My chevalet hardware kit arrived today, so I’m off to get it built. Then, I can begin working on the marquetry for the next box. Once one knows how it all works, it doesn’t seem so intimidating, even the more complex projects. It becomes a matter of practice, and commitment to the project. 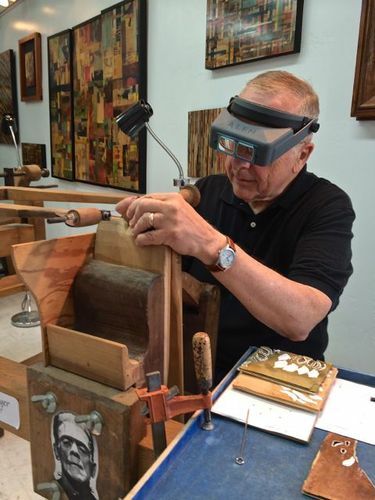 IT IS do-able for most folks to make outstanding marquetry for their projects. ASFM will teach you how. From then on, it’s nose to the grindstone till you get where you want to go. It’s not impossible. Take my word for it. LOL It’s just “Easier when you know”. I just got the opportunity to read this article, I also viewed the short video of the marquetry school on Fine woodworking.com that patric put out and all I can say is wow. It appears to be an incredible opportunity for someone to learn this unique and rare method from talented people.